The THRIVE Campaign: Equipping a vibrant church to be sent into the world. Provide opportunities and support that enables pastors and deacons to be healthy leaders who are growing in their faith and ministry skills, and be identified as such by their congregations. Rostered Ministers today face challenges due to changing societal norms and dramatically changing culture. Issues arise that were not taught in seminary. We are stronger and better together when rostered ministers are healthy in body, mind and spirit. Coaching of pastors is part of an overall strategy for continuing education. Pastors and congregation often face challenges which require more information and practical wisdom if they are to be dealt with effectively. Many pastors in the synod have wisdom and practical applications in the areas of preaching, education, evangelism, stewardship, large and small group dynamics, strategic planning, etc. The synod will make and publish a list of pastors with particular skills and insights so those who face challenges can ask for advice from a practical practitioner. The Bishop and her staff will also recommend a coach practitioner to pastors who they deem as needing help and advice. To assist our seminarians to graduate with less debt, and so seminarians feel they can serve in a variety of calls, five $5,000 grants per year will be provided to seminarians in financial need. This is a supplement to what the seminaries themselves and the ELCA Fund for Leaders are eligible to provide our candidates for ministry. This is one of the ways we cultivate for the whole church. In order to assist first call rostered ministers (both Deacons and Pastors) to eliminate seminary debt, ten $2,500 matching grants will be provided on an annual basis, for three years, to help first call Deacons and Pastors reduce the debt. The intention is for the rostered minister to remain in the congregation for five to seven years subject to the discretion of the Bishop. Every First Call pastor and deacon will receive executive, evangelism, stewardship, leadership and emotional intelligence training, plus spiritual direction, education in financial planning and more during the first three years of ministry. This can be extended to five years if there is a need or desire to continue learning. A Bishop’s convocation for rostered leaders is currently held early in Lent. Thrive! will add a second conference to be held in the fall prior to Advent. Topics for each will be practical, such as: preaching in Advent; learning how to better welcome visitors at Christmas services and invite them to return; best new practices in youth ministry or stewardship; etc. Presenters will include seminary professors, authors of the latest books on the topic, and bishops or others with expertise. 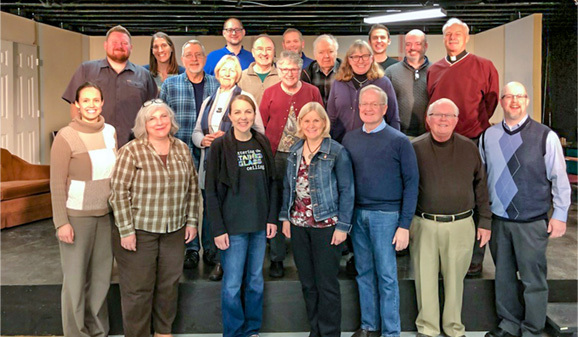 Workshops on the convocation topics, following the Stewardship Academy model and led by parish and retired pastors, will be made available in the six conferences of the synod. For more information contact Campaign Manager, Pastor Larry Donner, by completing the form below.